The map shows the RIR for the first half of 2008 in Hong Kong. 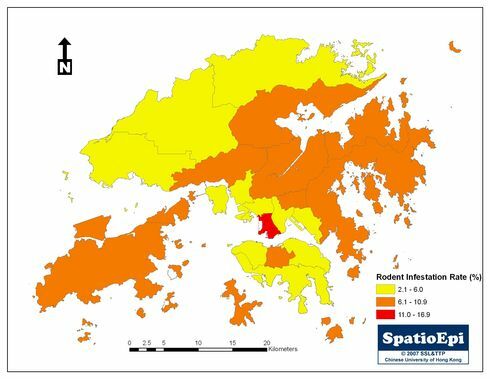 Yau Tsim Mong has the highest RIR of 16.9% (coloured in red) and Eastern district has the lowest, 2.7%. When the RIR of a district exceeds the 10 per cent, the Food and Environmental Hygiene Department (FEHD) would step up the rodent disinfestations operations. When an RIR reaches 20 per cent or higher, the relevant Government departments will form a joint task force and launch a special rodent control operation to strengthen rodent disinfestations and cleansing services comprehensively, and to promote rodent control in the community. In addition, the figure of Yau Tsim Mong is different from the data retrieved from FEHD, it is because FEHD uses 19 districts with Mong Kok as one independent district. Whereas Spatioepi uses the 18 administrative districts to display the data, where Mong Kok is part of Yau Tsim Mong.